Back to basics tip #22: I have been working on a few sewing projects. Yup. That means more sewing tutorials coming your way! Anyway, I have been collecting fabrics. Gorgeous fabrics. So I thought I would give you a tip as to how to organize your fabrics. Here’s what I do with my fabrics. I gather a bunch of them and wash them with like colors in the washer. Then dry them to prevent shrinking after I use them to sew my projects. If you don’t prewash your fabrics, it will affect whatever it is you are sewing. Only exception to this is specialty fabrics and home decor fabrics. Most of those will be dry clean only. After washing and drying, the cut edges will look like the picture above, tangled in frays. So I go through, cut off the frays and fold them. Finally, I organize them by colors in clear plastic bins. Once a certain color bin gets full, I know I have to use up some of this fabric before I can purchase more. No matter how cute the fabric maybe. I also have a bin for the scraps. 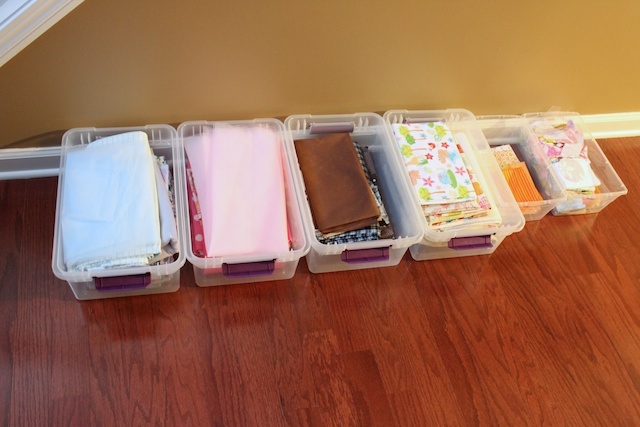 The bin systems works well for me because the fabric won’t get dusty or dirty in the bins. It also limits the amount of fabric I can collect since I don’t have a craft room. I have a craft closet. 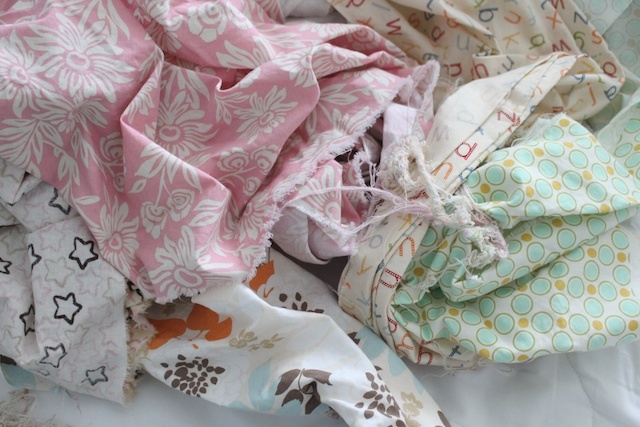 » Tell me… How do you organize your fabric? Do you organize them by fabric type? Do you have a dresser or closet where you keep your fabric? I have a dresser that I keep all of my fabric in. I mostly buy remnants since almost all of the sewing I do is quilts. I group it by colors and I also have a scrap spot. good idea! i just have in paper bins and its a hot mess in there. i should def do this. will give me space in the closet of my craft room. I definitely have to be able to see things quickly or else I forget what I have. I use clear plastic bins for the larger cuts and once I fold the fabric, I lay it side by side so I can see everything when I open the lid. For the smaller cuts, I keep them in one of those cheap clear plastic “dressers” and do the same thing (side by side instead of stacked). For the scraps, I just toss them in a box. A few of your fabrics look familiar 🙂 I am looking forward to your tutorials! I had some of those over the door organizers and organized my fabrics by color that way. It doesn’t take up a lot of space and its easy to see all my fabrics. First I’ve got to use up a whole bunch of the large closet and armoire of fabric. Then I’ll organize what’s left. Hmmm…I’ve been saying that for about ten years. On the brighter side, I do wash all the cottons as soon as they come in. I’ve got a serger, so the edges get serged prior to washing eliminating the tangles threads. You can also save more time and thread by just using a pinking rotary blade on the non-selvage edges of your fabric before you wash. It will still fray a bit, but not much. i know about that temptation you speak of. there are so many great fabric designers out there! I am really struggling with this…I just learned how to sew, an I have stuff every where!! Thread, ribbon, fabric….it’s like I had a third child and its name is Sewing Clutter! Thanks for the great ideas! That is such a helpful idea! All I have is a big box that I have to rummage through to find what I think I might still have. I will be buying boxes as soon as I finish moving. Thank you for all the great tips!